A generation of children in South Sudan are growing up in hunger and without education. There is hope for some children with school feeding provided by the UN World Food Programme (WFP). So far this year, WFP has fed about 192,000 children in South Sudan with meals in schools that are still open. When WFP sees an area where hunger rates are high, they set up school feeding to help. It’s a food for education initiative. If you can feed children at school, that encourages parents to send their children. The promise of a free meal at school means everything in area where hunger and poverty are so high. School meals are considered a safety net for the poor. Around 20,000 school girls are receiving take-home rations as well. This improves school attendance rates among girls, which are historically lower. Overall, the school feeding is an effective way to feed children and allow them to stay in school. This keeps the children safe from recruitment into armed forces and other dangers. WFP relies on voluntary donations to keep school feeding and other food programs operating. They need donations more than ever in areas struck by conflict like South Sudan. The Norwegian Refugee Council is calling on the world to increase aid for Somali children displaced by conflict and famine. Last summer the world was stunned with tens of thousands of Somali children starving to death. A severe drought had struck Somalia and East Africa, causing massive food shortages. Conflict within Somalia made the situation far worse by preventing aid from reaching the needy. Thousands of children and their families were able to flee the worst hunger and conflict areas. 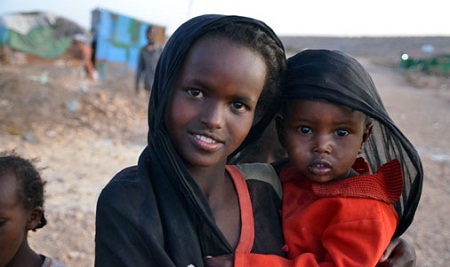 Many of these “children of famine” found refuge in camps in Dadaab, Kenya. A year later their plight in the refugee camps is largely silent to the world. The Norwegian Refugee Council (NRC) wants to change this by focusing on these children’s needs. They have a chance to recover if the world gives them enough help. Somali refugees need the basics of food, water, shelter. They also need education to learn and develop the skills needed to get out of these camps and build a life. NRC issued a report in May about the lack of educational resources at the Dadaab camps. Dadaab does not have enough school facilities and teachers. There are 221,000 school age children in the refugee camps but only 57,000 are enrolled in school. Funding is needed to build up the schools. NRC is partnering with other organizations on developing accelerated learning programs to help children “catch up” and get their education back on track. For those who are already enrolled in school at Dadaab, there is the problem of staying the course. The NRC report says, “The number of students who actually complete school is much lower, as the drop out rates are very high especially for girls.” The challenge is getting kids into school in East Africa and then keeping them there to finish their education. School feeding programs run by the UN World Food Programme and other groups are vital especially with malnutrition being such a threat to the refugees. Astrid Sehl, an NRC officer, recently took some time to answer a few questions on how the world can help the children of the East Africa famine. What is being done to increase the number of schools and teachers in the Daddab refugee camp? UN and non-governmental organizations are doing what they can to build more schools and educate more teachers in Dadaab – e.g. the joint Education strategy (Accelerated learning program). However, as always, funding when it comes to crises and education, is very limited, and a lot more should be done! Could take home rations be added to any existing school feeding in order to reduce the dropout rate? Yes, take home rations is a good idea. For the time being, we provide school feeding and we are investigating funding opportunities for take-home rations (or introducing school gardens, where the kids are taught how to grow vegetables and they can bring the knowledge and produce home). For children displaced inside Somalia has NRC been able to reach them with educational materials? Yes, we have large educational programs for internally displaced persons across Somalia – in Somaliland, Puntland and South Central. So we’re supporting thousands of internally displaced children and youth with education, skills training, we train teachers and build schools – but again – more efforts are required to meet children’s right to education. If you went shopping after World War II, you could walk into a store and make a life-saving purchase. Even if you were at home, you could do the same great deed simply through mail order. What was this mystery item people bought by the thousands after the war? These were CARE packages to send to hungry people in countries lying in ruin. General Lucius Clay, commander of the American military government in Germany, made appeals to the public to send these packages. So did many others from all walks of life. This is how America reacted to the plight of those suffering overseas. You had several options when buying a CARE package. 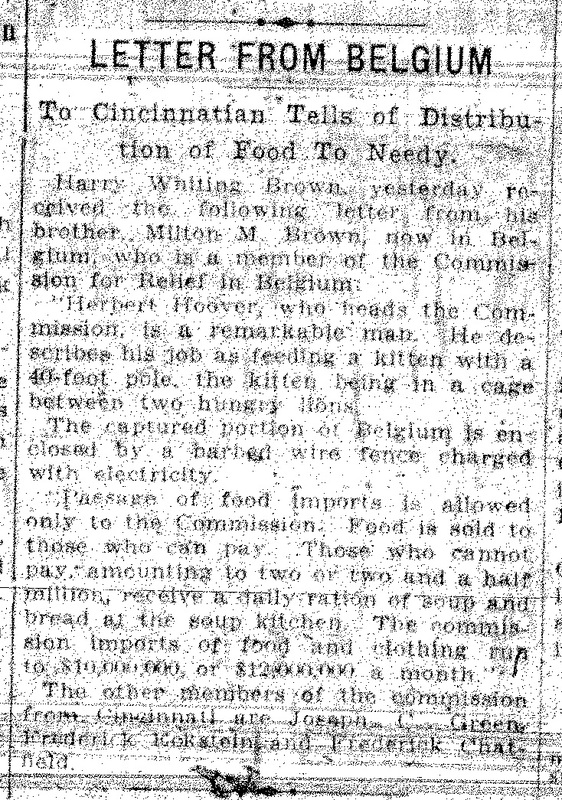 There were general rations which you could send to a family, or you could have these sent to an orphanage or hospital. Another option was to buy a CARE package specially designed for infants, one with baby food. Well, today that CARE package for infants would come in the form of plumpy’nut, the miracle food recently profiled on the NBC Nightly News. This is a life-saving food for small children. Plumpy’nut is peanut paste that comes wrapped in a small package, like many foods you find in grocery stores; except plumpy’nut is food specially designed to provide quick nutrients to severely malnourished children. It is widely used in areas struck by conflict, natural disasters, or extreme poverty. Plumpy’nut is easy to distribute because it does not require special preparation and storage. In East Africa, where drought has caused massive food shortages, plumpy’nut is being distributed to children. It is saving their lives. Infants need proper nutrition in what is called the critical first 1,000 days. Without the nutrients, they will suffer lasting physical or mental damage. Thousands of children have already starved to death in East Africa because of the food shortages, but those that get plumpy’nut can be saved. A full supply of plumpy’nut is needed in East Africa to prevent more deaths. Plumpy’nut production has to keep running at Edesia and other factories that produce the miracle food. But funding is always an issue, as aid agencies continually face this challenge. Not enough resources are committed by the international community toward fighting child hunger. The UN World Food Programme and other organizations are well short of funding to meet the demand. Plumpy’nut is needed in many more areas of the globe: Afghanistan, Yemen, Democratic Republic of the Congo, Pakistan, and Haiti, just to name a few. All of these countries have high rates of child malnutrition, and plumpy’nut and its variations are desperately needed. 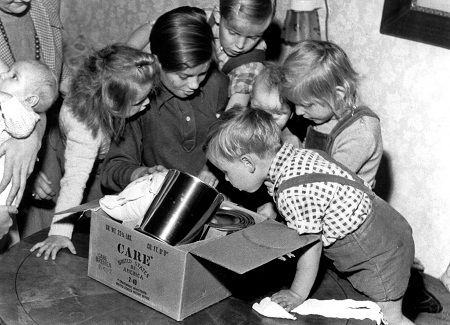 After World War II, stores like the H. & S. Pogue Company of Cincinnati even had displays of CARE packages. The Cincinnati Enquirer reported that upon Pogue’s grand opening of their display in 1947, Captain Victor Heintz made the first purchase. Heintz was a World War I veteran who served on the front lines in France. Years later, he was again coming to the aid of France in the form of a CARE package. Another Cincinnati resident, Siegfried Deutsch, got started well before Pogue’s CARE outlet opened. Deutsch bought at least 35 CARE packages. The Enquirer said number 35 went to a poverty-stricken mother and her young daughter in Vienna, Austria, Deutsch’s homeland. Retail stores today could offer an outlet for people to buy CARE plumpy packages for starving infants overseas. As the CARE package made such a difference saving lives, winning the peace, and rebuilding Europe after World War II, plumpy packages can do the same today. Article first published as Plumpy’nut: A Modern-Day CARE Package on Blogcritics Magazine. Last month I published an interview with Kate O’Malley of Irish Americans Support Somalia. The group is dedicated to raising awareness and funds to help save lives in East Africa. Here are some updates as posted on their facebook page. The video below highlights a donation made by several organizations to Edesia, which is producing plumpy’nut for aid agencies to distribute in East Africa. “In memory of Ray McKenna, and in the spirit of “Honoring our History by Helping Famine Victims Today”, Edesia received a total of $1250.00 in donations on October 9, 2011 from the following organizations: Rhode Island Police Officers Emerald Society, Friendly Sons of St. Patrick of Pawtucket, Providence St. Patrick’s Day Parade Committee, Ancient Order of Hibernians – State Board and Newport Chapter, and the RI Irish Famine Memorial Committee. Thank you! Did you know that our online reach now extends to supporters from 7 countries and 9 U.S. states? And that’s just who we know about! With your help we can build this movement which so far includes people in Australia, Japan, Haiti, Ireland, South Africa, British Columbia, and OH, NC, VA, CO, CA, FL, RI, CT, and MA in the USA. Irish or not, we are concerned parents, newspaper editors, committed high school and college students, nationally renowned authors, university professors, business owners, musicians, community activists, historians, and most importantly we are global citizens who can make a difference. Visit Irish Americans Support of Somalia at Facebook and WordPress. With a hunger crisis engulfing nearly one billion people worldwide, leaders need to step up. Drew Brees of the New Orleans Saints is doing just that. 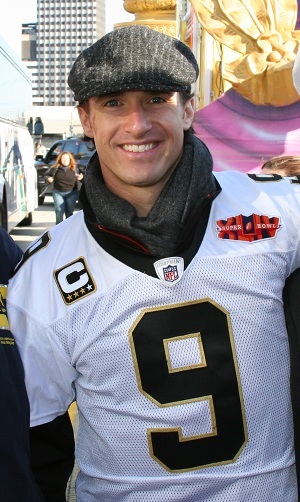 Brees has been named an ambassador for the United Nations World Food Programme (WFP), the largest food aid organization. WFP, which fights hunger in over 70 countries, is a UN agency that depends entirely on voluntary donations. Brees, the 2010 Super Bowl MVP, is urging support for famine relief in the Horn of Africa. Severe drought, coupled with conflict, has caused massive food shortages in Somalia, Ethiopia, Kenya, and other parts of East Africa. WFP is the lead agency in fighting the famine which has put over 13 million people at risk of starvation. Children are suffering from severe malnutrition and thousands have already perished. Many can still be saved if relief efforts are supported. Brees’ advocacy will be critical in keeping focus on the crisis which will extend for many more months until harvests can improve. WFP is currently short over $200 million for its East Africa relief mission. At the same time, severe food shortages are also being reported in Afghanistan, Sudan, and many other corners of the globe. WFP faces funding shortages in these areas as well and has been forced to scale back child feeding programs. Global hunger issues struggle to get the media spotlight. Even the famine in East Africa, which was one of the worst humanitarian tragedies in decades, failed to attract a great deal of media attention when the story broke this summer. Food ambassadors like Drew Brees are desperately needed right now to spread the word, and take the lead in sounding the alarm for this massive hunger crisis. Visit the Horn of Africa donation page.